Rachel and Steve outdid themselves. When my dear wife Karen stepped the door of the Little Bitty last night, she spotted the package on the kitchen table immediately. 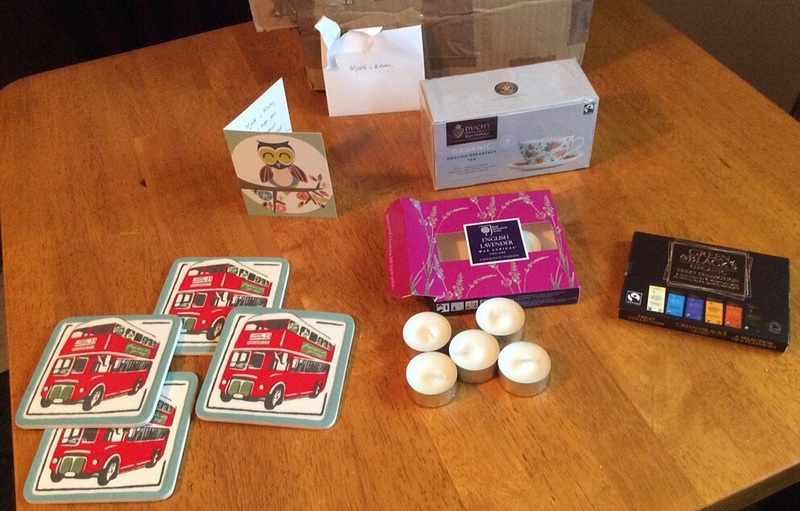 I announced that the BloggyVille mystery gift from across the pond, the prize I’d won because Rachel, Lundy Girl from the blog Could Do Worse: Adventures in London, had drawn my name from a hat, sat right there, awaiting our spousal team approach to opening. First up, Karen at the outer boundary. Karen took the tape out of the equation. And this package, sent by post all those miles, had been secured well. Then I reminded my dear wife of the email we’d received from Rachel just that very morning, warning that the insides were packed very tightly. I was a little careful. I dove right in without a care. It was indeed packed very tightly. These prizes had not a chance of shifting en route, let me tell you. They slid out into our world, one delightful box after the other. Great goodies from across the big pond. I opened a card with a heartfelt, hand-written message from Rachel and Steve. They have indeed become real friends, these Londoners, because she and I read each others blogs faithfully, trade comments like conversations, and began and continue email correspondence about life’s good times and tight spots. Karen exclaimed her happiness at each piece of our gift. Chocolate candies, of Green & Black’s Organic Treat Collections. Cool candles, of English Lavender. I wowed as I opened a box and pulled out coasters with art of London street cars. There’s a box of Duchy English Breakfast Tea. All of this, great and unique and exotic to my eyes and nose, because I said Happy Blogging Anniversary in Rachel’s comment box that day, something I’d have done, period. Oh, my. Thank you so very much, Rachel and Steve, for bringing a piece of your world to our Little Bitty. We will cherish it all. Eat it, drink it, use it, yes, and treasure the memory and the friendship. What’s your favorite kind of chocolate? What’s your favorite scent of candle? What’s your favorite kind of tea? Congrats. You certainly scored a tasty award. I know, Benson, MDW Karen gets the chocolate. I get to share the tea and wonderful lavender scent and coaster fun and overall happy happy. What an amazing story Mark! Proof that great friendships can indeed be forged big pond or not. It proves that our BloggyVille is a meaningful world, Teela. Thank you, my friend, for being part of mine. And thank you. It’s nice to be called friend. I appreciate you, Ellie B and Karen. I hope yall have a great day. Ha ha you triggered memories with this one. The best tea I’ve ever had was served to me by a man named Steve in Bexley Heath which is one of London’s burbs. They really know their tea away there, over the pond. What a lovely gift box and a happy surprise too. I’d say enjoy the treats but I know you will. Great memory from over there, alady! I am going to enjoy a cup of British tea this weekend, when I can linger unattended by obigatory work stresses. 🙂 In other words, I am gonna enjoy the treats! ;-o Thanks for joining in on the pleasure of this discovery today. omg, i am so jealous! what a great surprise package! my fav chocolates are the cadburys. especially the carmello, milk chocolate with caramel inside. Wow Mark that is great congratulations on winning! I have a confession to make. I have never had a piece of chocolate I didn’t like LOL. My favorite candle scent is clean linen, my favorite tea is green tea. I think you are not alone in your chocolate-swooning ways, UpMom! Your tastes are admirable across the board, too. How did the sale go? I didn’t miss a report at your place, did I? I want to try that tea. Love English Breakfast tea. Though I’m not sure the kind I usually drink has ever seen England with its own eyes. As long as some copywriter has a proper imagination, Scott! This may be the sweetest post ever, Mark! Since you asked, my current favorite kind of chocolate is in my blog post today. We cross paths in BloggyVille again, Ann. Sweett! Great little gifts from far away, enjoy. Thanks, Dora. We will enjoy for a long time! Hope you are well in SoCal! Mark, we’re actually in the central San Joaquin Valley, an agricultural area of the state. Oh man!! A woman after my own heart! Wow that is awesome all nice things and so many. I love dark chocolate with mint. I just like black tea but will do herbal sometimes and the only candles I burn are beeswax because it smells like honey and no carcinogenics going into the air when I burn them (I am kinda big on that, hence my blog) LOL Congrats again. Thanks, Donna! Enjoy your day in best of health! What a great way to start my day . 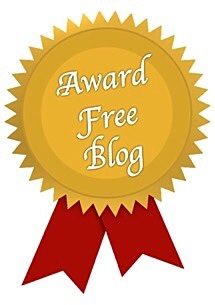 . . sharing time with you, my blog bud!! I couldn’t wait to find out what was in your package 🙂 Wonderful treats, for sure!!! I love the friendships I have cultivated on WordPress, whether we ever meet in person, or not. Personally, I am not a tea drinker, love milk chocolate, and my favorite candle scents are patchouli, pine, honeysuckle, mango, and peanut butter cookie (which I can’t find anymore). English lavender is wonderful, too. Here’s to a great week ahead! I am bound & determined to get a new post up by the end of the coming weekend! Patchouili! Such a child of our shared 1970s, Sadie and that gives me a great smile today. 🙂 Get the most out of your work week until the weekend. I hope your new gig is going well, what with you passing the insurance test. You rock, my friend. I’m proud! And you never know when life will bring blogging friends together. The world is small, they say. Dark chocolate truffles, lavender and Lipton. What precious friends you have! A lovely package they put together for you. I enjoyed seeing the contents, they did a great job! To be enjoyed for many days to come, I know. 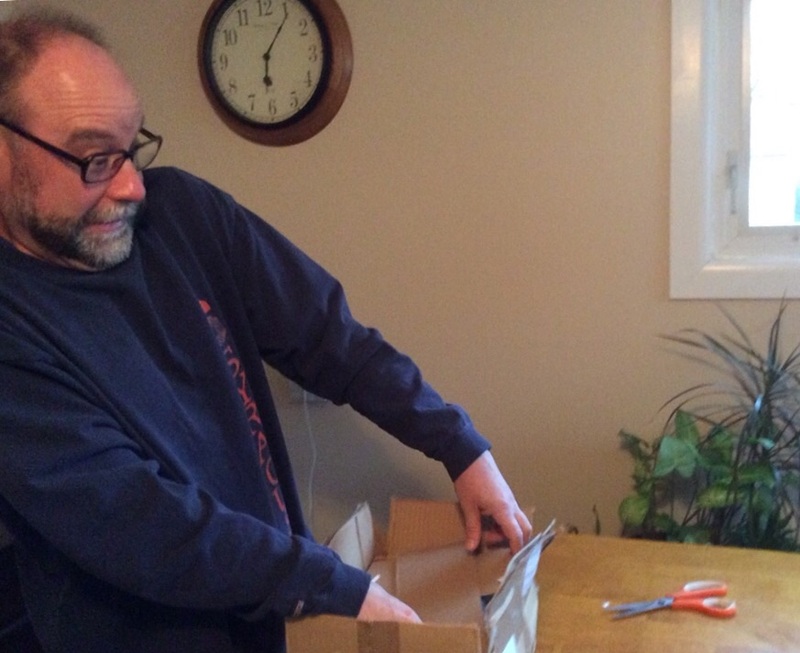 That’s wonderful Mark – love your expression while you are opening the parcel. I was sneaking up on it, Paul. 🙂 Thank you, my friend. I think it could not have gone to a better couple, Mark and Karen! Hugs and so happy for you both to feel like you won the prize. You are our prizes, Mark. 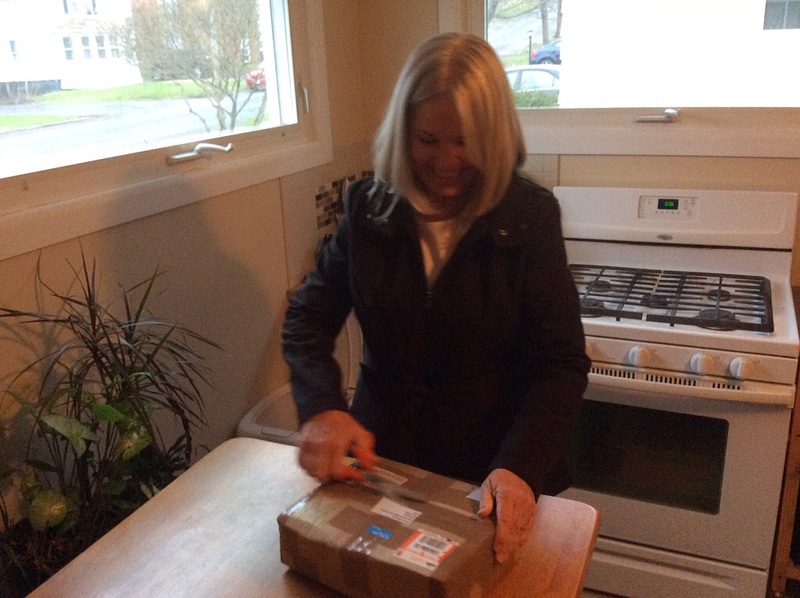 We love the smiles, sharing your package with us, too. Chocolate, dark chocolate, the darker the better. But that’s just me. Enjoy your tea for two, too. It’s a great gift, MBC, and now I’m thirsting for some zingy iced ginger tea! Yes, I love our London street car coasters, Red. Bright red, they are. Rachel and Steve picked well. I can’t stop smiling. I love when these kinds of blogging relationships are formed. The word is, indeed, becoming smaller. I’ll hold you to that once my construction work is finished, towards the end of summer. Yes. My Rachels treat me the best. No joking. Chocolate, dark 80% at least. Now I’m dizzy and about to go outside to paint. I think coffee and chocolate will do. Paint like you do so well, my friend. Coffee and chocolate should always do, Martha. Happy anniversary to Rachel and Steve, and congratulations to you, Mark and Karen. What a lovely idea! Let’s see…as you can see by my user name, we have created an Anglo-American hybrid household, so I am well-acquainted with treats from across the Pond. I love the Cadbury’s Fudge bar and PG Tips for my cuppa. Candle-wise…um…Yankee Candle has a nice wild cherry scented one. I want to hop on a plane now. Your hybrid household sounds interesting, my new friend. Thanks for stopping in and commenting. Yankee Candle and Cadbury and PG Tips. Go for it!